Joe Danger Arriving on Mac and Linux "Real Soon"
Developer announces that Joe Danger and its sequel will be crash landing on Mac and Linux platforms via Steam some time in the near future. Developer Hello Games has revealed that its motorcycle daredevil series, Joe Danger, will be breaking into two new platforms, Mac and Linux, through Steam. The announcement was made via the company blog, with no release date included other than "real soon!" 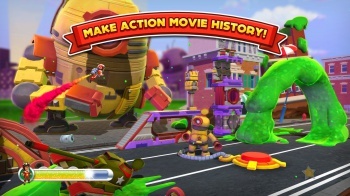 The Mac and Linux version of Joe Danger 2: The Movie will feature additional content seen in the recent PC release of that game, such as extra playable characters, including the mercenaries from Steam darling Team Fortress 2, and a Minecraft-inspired level. Also included will be an "Ultra Hard PC Challenge" available from the main menu of each of the two games. Hello Games is especially excited for the Linux version of their Joe Danger games, according to the blog, because it makes the titles ready for SteamOS and the upcoming living room "Steam boxes." The PC version of Joe Danger and Joe Danger 2: The Movie were both released on Steam this past June. Both games are also due on the PS Vita some time in 2014. Joe Danger launched on the PlayStation Network in 2010 with its sequel appearing on PlayStation Network and Xbox Live Arcade in 2012.